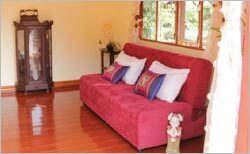 For the weary of body and mind let yourself go, come and relax at Bann Suan Nuchliang Home Stay Resort. Enjoy total privacy in the tranquility of our beautiful garden environment. You can take pleasure in viewing the lumpradong river. Be at one with nature as you find peace among the flora and fauna of this wonderful natural setting.